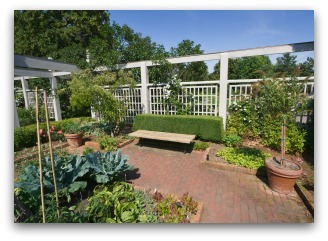 Here are some great garden fence plans and ideas to help plan your vegetable garden area. Learn how easy it is to build a fence to enclose and protect your vegetable garden! 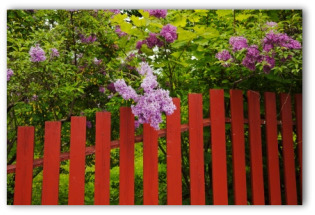 Wood, vinyl, wire, wrought iron, and living plants can be used for fencing your garden. 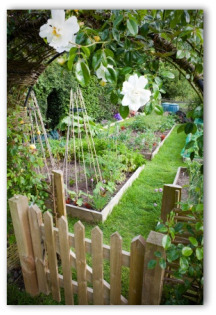 There are many classic types of vegetable gardens and vegetable garden fence ideas! Where adequate gardening space allows, row garden are traditionally cultivated. Crops planted in rows running from north to south take advantage of both morning and afternoon sunlight, where each plant receives a healthy dose. Spacing left between the rows permits easy accessibility for gardeners performing maintenance chores such as weeding and watering. 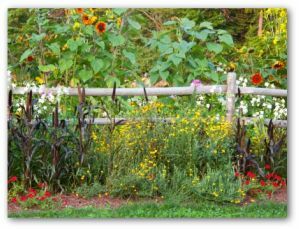 Frequently, a row garden exists without formal boundaries but some of the most eye-pleasing gardens have borders made of fencing. 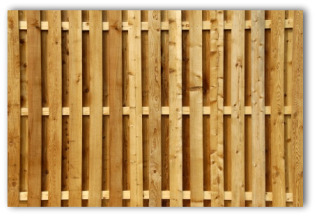 Fence materials can consist of stone, timber, brick, or even hedges. By establishing a well-defined border in your vegetable garden, sowing or mowing becomes much easier. As the old saying goes about strong fences making the best neighbors--that includes neighboring animals as well! One of the bandits of the night that might be raiding your crops before you get a chance to harvest them, is a raccoon. Rabbits also like to make early morning visits for their breakfast buffet. When planning a garden fence, it is a good idea to provide a barrier of protection for your valuable vegetables against invaders of the nocturnal kind. If you suspect these furry four-legged creatures, you can let your fence top flop. Use a chicken wire fencing material, but do not attach the top 1 foot of wire to the posts. When a raccoon tries to climb up, the loose portion will bend backward and keep the animal from making it over the top into your garden down below. Garden fence plans are not as quick or simple solutions as repellants or scare devices but if other tactics have failed, here are some ideas for fencing out unwelcome visitors. 1. Cut several 5 foot lengths of 1 inch mesh chicken wire. 2. Attach a fiberglass or metal pole to each end of the chicken wire panel. Allow an extra foot of the post to extend past the bottom of the fencing, so that the posts can be pushed into the ground. 3. Use the panels to surround susceptible crops such as young broccoli plants or lettuce. When the fence is no longer needed, remove the panels and store for later use. Another crafty idea when designing garden fence plans to outfox the critters is to make a fence of landscape fabric. Floating row covers, which are widely used as season extenders and insect barriers, can also serve as effective defenses against animals. Simply layer the lightweight gardening ground-cover material over crops to keep the pests such as woodchucks and rabbits at bay. 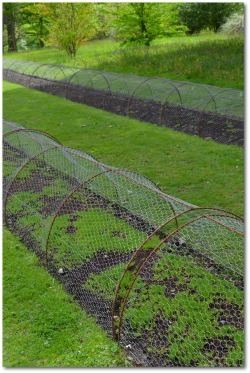 If it is rabbits that are loading up on free vittles, a 3 foot high fence made of chicken wire should solve the problem. However, for burrowing animals such as rabbits, it may be necessary to bury a portion of your garden fence. 1. Dig a trench about 6 inches deep and a foot wide around the perimeter of your garden. 2. Set metal or fiberglass posts on the garden side of the trench.You will need one post for each corner and additional posts for each 6 to 8 feet of fence. 3. Attach 4 foot welded wire fencing to the posts. 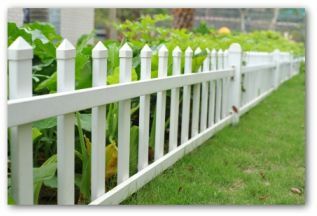 Before you staple the material in place, bend the lower 1 foot of the fence outward at a right angle so that it lines the trench bottom. 4. Fill in the trench with dirt. Add a single strand of electric wire a few inches above the top of the welded wire fence.